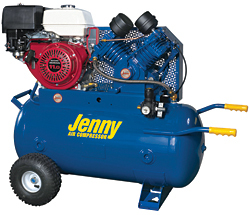 The single-stage J11HGA-30P includes a 30-gallon air tank and features a belt-driven J pump, a single-stage, four-cylinder pump with a high-compression ratio for producing maximum airflow. The compressor includes two pneumatic tires, and convenient lifting handles are integrated into opposite ends of the compressor’s frame. The compressor also comes equipped with a manual tank drain, safety relief valve, large canister intake with replaceable filter elements, and protected fittings, as well as tank, regulator, and outlet pressure gauges.